Live the high life at this three bedroom apartment on the Mediterranean-style Bella Piazza community! Take a dip in the communal pool, or cook up a feast on the BBQ area. From your apartment you can reach the Disney parks in around 25 minutes. King-size bed, door to balcony, ceiling fan, flatscreen TV, slide closet. En-suite bathroom contains a bath tub, shower cubicle, double sink unit, WC. Queen-size bed, ceiling fan, flatscreen TV, slide closet. En-suite bathroom contains a shower cubicle, sink unit, WC. Family bathroom next to Bedroom 3 contains shower over bath, sink unit, WC. This three bedroom apartment is the perfect base for your Florida adventure! Spend time taking in the community view from the balcony, or head down to use the facilities which include a gym, communal swimming pools, children’s splash pool and a BBQ area. From Bella Piazza you can be at the Disney parks in 25 minutes, while a trip to SeaWorld or Universal will take a further ten minutes. 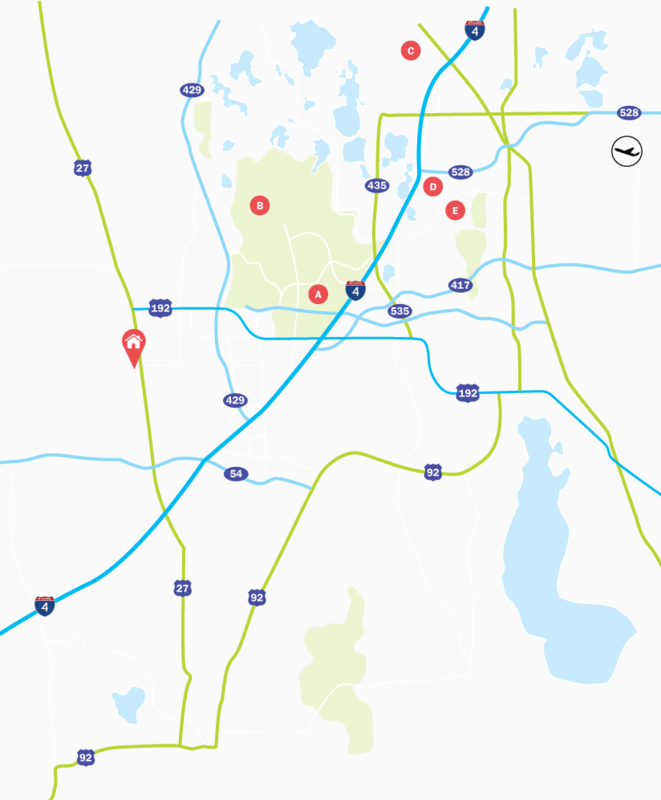 Treat yourself to a meal out at one of the many restaurants or bars that line the popular tourist corridor of the US192 just a few minutes north of the community; with such a wide selection there is something to suit all tastes and budgets! If you are walking, head to the nearby Berry Town Center, which includes an English-style bar as well as various other bars and restaurants. Living Accommodation - The modern kitchen with black appliances and granite worktops is on the left as you enter the apartment. Show off your culinary skills to the two guests seated at the breakfast bar, as you prepare a meal to be enjoyed at the dining table behind the kitchen. Here, there is seating for six people who can gather round and discuss the day’s events! Behind the dining area at the rear of the apartment is the lounge area. Put your feet up and relax on the one of the two sofas and watch a show on the wall-mounted flatscreen TV. If the evening is warm, why not open the patio doors and head out onto the balcony? Bedrooms - The Master bedroom is at the rear of the apartment on the left. It has a King-size bed, en-suite bathroom and door leading out onto the balcony. Bedroom 2 is at the front of the apartment on the right and has a Queen-size bed and en-suite bathroom. Bedroom 3 is nearby and has Twin beds. Each bedroom is neutrally decorated with a ceiling fan, mirrored closet and flatscreen TV for the comfort and convenience of every guest. Outdoor Living - Watch the evening draw in from the balcony at the rear of the apartment. You can even enjoy a light bite and a drink on the table and chairs provided! Bella Piazza, completed in 2008, is a community made up of Mediterranean-style condos, between the US192 and the I-4 highway just off the US27. A supermarket, bars and small range of restaurants are just a 5-minute walk away at the Berry Town Centre. With plenty of resort facilities to use and the Disney theme parks being just a 15-20 minute car journey away this community is a sublime choice for all families no matter what their age.